Tairyou Ichiba translates roughly to "Big Catch Market" and as I stepped into the restaurant, I realized that the name actually says some accurate things about the restaurant. The atmosphere was quite boisterous and the decor had a level of elaborateness in between that of a cafe and a fast food restaurant. I heard the waitresses speak Japanese, and got a spot along with my dining partner, Dorothy (@DOOROTHY), without having to wait. That was about the only time I didn't have to wait for something during my visit. The menu posted on Urbanspoon for Tairyou Ichiba was from 2012, which had all nigiri sushi listed at $1 per piece. That was what drew me to this restaurant in the first place, but when I received the menu, I saw that the prices of the nigiri had risen and a lot more choices were added to all sections of the menu. Well, variety attracts me just as much as low prices, so I ended up trying lots of different items along with Dorothy. In fact, I tried so many items that I felt the need to repeatedly reassure the waitress, "Yep, I'm just really, really hungry today." She couldn't fit everything I wanted onto one page, and we had some good laughs about that one. The Ebi Mayo used a tempura batter, which I found a little too chewy and hard. In addition, the shrimp was also rather chewy, but flavouring-wise, there was nothing largely amiss. The mayo had a taste similar to that of margarine and went well with the shrimp. I always feel the need to try out rare and unique things I see on menus at sushi restaurants, so I got the Ebi Tempura Nigiri, which came with a full piece of prawn tempura. It had too much batter, which made the roll very crunchy. However, the teriyaki sauce enhanced the flavour of the prawn. 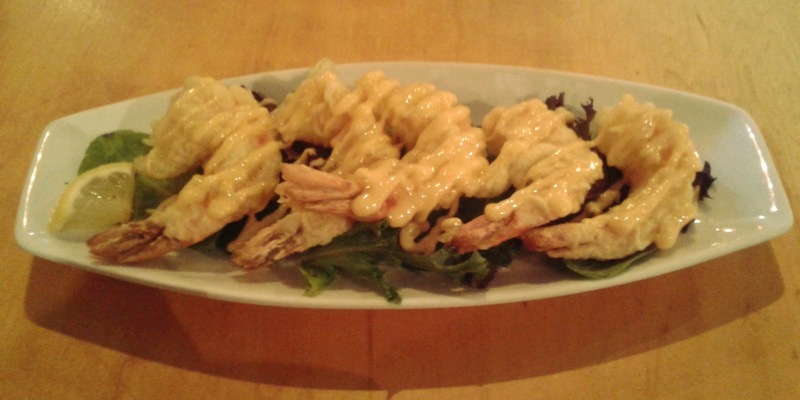 Prawn tempura and rice do make a good combination, much like a Tempura Don. 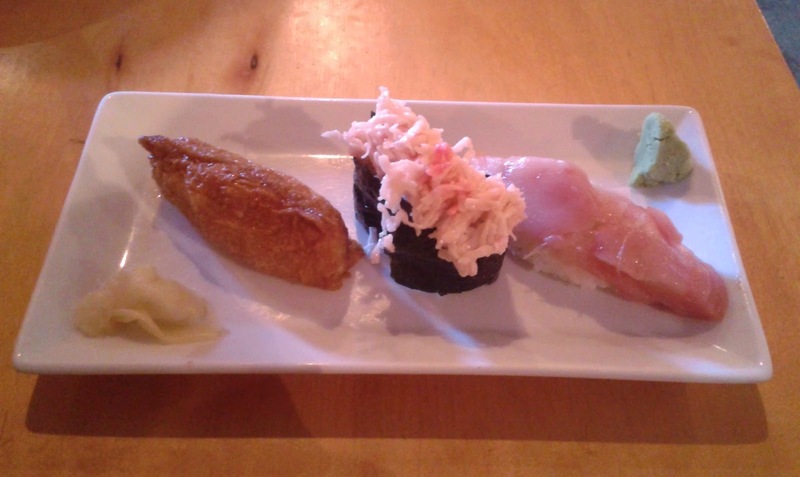 Dorothy had the Hokkigai Nigiri, which was a fresh, solid piece of nigiri. The Salmon Nigiri was not cut evenly, and from the photo, it is quite obvious that one has much more fish than the other. The fish was fresh, but the rice was gummy and long-grained (sushi rice should be short-grained). The Heap Up! Mayo-Corn Nigiri is one of the jumbo-sized nigiri served by Tairyou Ichiba. The description for that section says "Mega Size Nigiri for Sushi Lovers". Being a sushi lover myself, I felt compelled to try at least one item from that section. 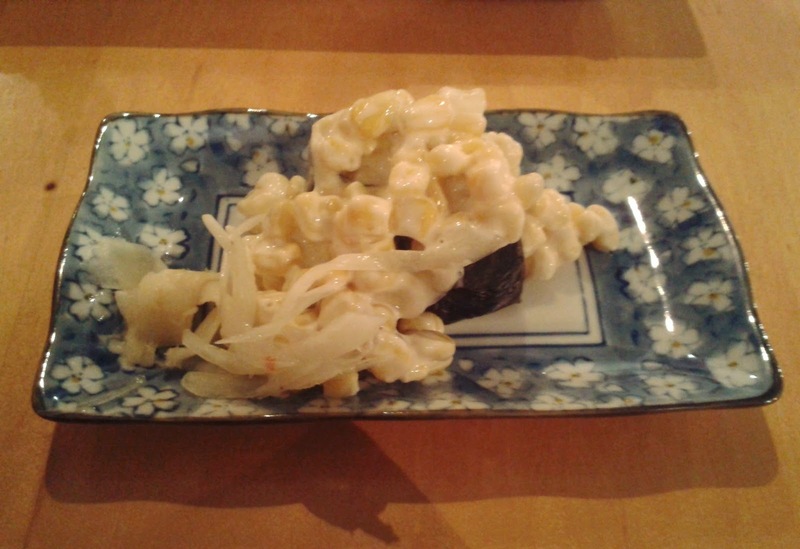 This piece of nigiri was served chilly and was overflowing with mayonnaise-covered corn. Mayonnaise was not the best choice of sauce for this piece of nigiri, as it made the corn a little sour. The seaweed and rice was packed too densely, but the mayonnaise went well with the rice. I'm not sure why there was onion served with this nigiri, because it tasted rather out of place. What I am sure of is that there's probably a better way to present this roll. 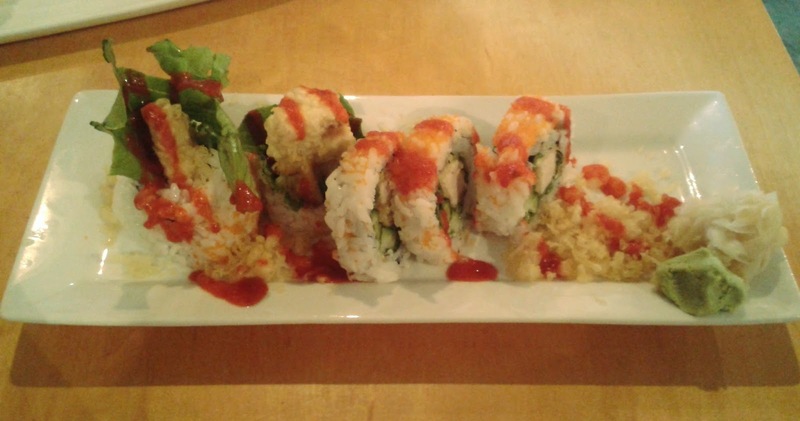 The Red Volcano Roll consisted of spicy tuna tempura, cucumber, lettuce and tempura bits. This vivid and colourful roll was unfortunately a disaster covered up by another disaster. The tuna tempura severely lacked flavour and there was too much densely-packed rice on the outside. The roll was rather dry. The spicy sauce was so spicy that it completely overwhelmed everything else inside. By the time I finished this roll, the waitress had to refill my tea for the fifth time. Dorothy played it safe and after one piece, she stuck with the tempura bits instead. The Inari Nigiri lacked flavouring, was a little mushy and had a rather rough texture. The appetizing, sweet flavour of bean curd was not present. Dorothy was more happy with her Kani Mayo Nigiri than I was with any of my nigiri. She thought that the mayonnaise went well with the rice and seaweed, although it gave the crab meat a buttery texture, which she found a little strange. The Tuna Nigiri displayed some questionable knife skills. It appeared to me that they had an accident cutting this piece of nigiri, but didn't want to waste the fish so they put it back together ... kind of. I would call this one "Chopped Tuna Nigiri". Because it was chopped up, it immediately fell apart as I tried to pick it up. The tuna was so soft that it had a consistency close to that of mashed potatoes, which made the "sushi rice" seem quite hard in comparison. 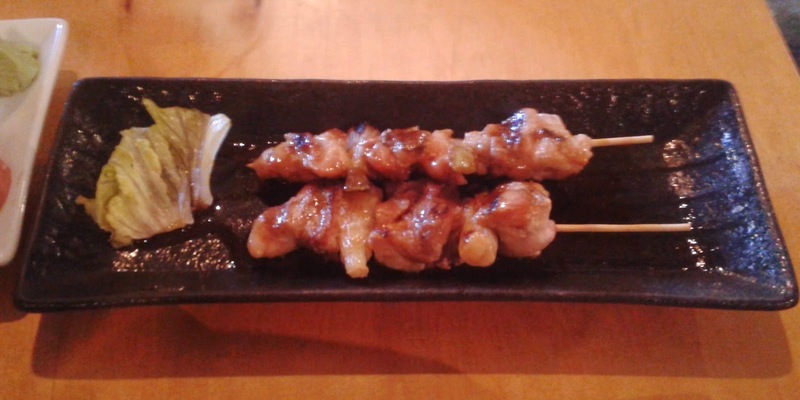 The Yakitori was quite good in comparison and the chicken was mostly tender and juicy. However, the teriyaki sauce was too weak, so the chicken was slightly lacking in flavouring. The Tako Nigiri came with quite a large piece of octopus and Dorothy remarked that it was fresh and decent. However, this piece of nigiri could be improved by a more even cutting (it was noticeably thicker in some parts than others). The Aburi Salmon Nigiri exhibited a nice gloss and a marbly texture, and was quite juicy. The juiciness was further enhanced by the salmon roe. However, it tasted more like half-cooked salmon rather than seared salmon. The garnish of onion on top made no sense in terms of taste, but fortunately for me, the onion slid off when I picked the nigiri up. The Aburi Toro Nigiri was also very juicy, but was more marinated than seared. There was a slight lack of flavour and the wasabi was out of place, but there was a good fish-to-rice ratio with this piece of nigiri. Tairyou Ichiba deserves merit for the wonderful attitudes displayed by the waitresses. In terms of food, there were some solid items and an approximately equal number of misses. It would be nice if they thought about where onion slices would be appropriate. It would also be nice if I had a waitress standing next to me with a tea kettle ready to refill my tea every time I took a bite into the Red Volcano Roll. Apparently, that is not the spiciest roll they serve. On the menu, I saw a roll that was so spicy that beside it, it said "You will regret it ..."